When I was still living at home, dad used to take the family out for dinner. One of the dishes that was very tasty, but rarely ordered was pea shoots stir-fried with garlic. With that in mind, I ordered some from my favorite online seed shop (http://www.kingsseeds.co.nz/). They had this variety called Fiji Feathers (Product Code 5525) that I thought I’d try. So, the peas arrived about a month ago, and I sowed some in 6 small-ish containers and a container each of mustard and cress. 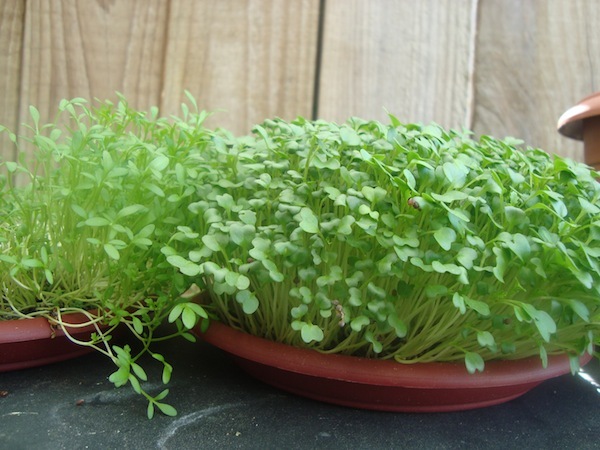 Within 2 weeks, I had mustard and cress tall enough to snip with scissors. It’s been a while since I last updated the blog. But it has been a while since I’ve been sewing, making crafts or baking. Blogging does seem to take a lot of time and effort when the day is all go between the waking and sleeping hours. Anyhow, I did get some sewing done in the last few weeks. I had some navy polka dot fabric and thought it would be perfect for the Oliver + S Bubble Dress. I had extra fabric, so I made the Bucket Hat from Little Things to Sew. After I finished the dress, I realised that it would have looked even better with red piping round where you joined the bodice and the skirt. 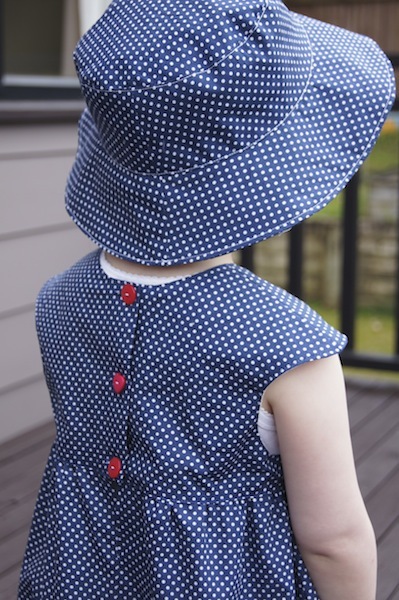 And I had envisioned a matching hat with red flowers or ribbon of some sort – but I didn’t have any on hand. As for the buttons, I only had 2 round ones, the heart button is there only because it was the closest match colour-wise. Miss S had a ball “modeling” the outfit – she got to prance around on the deck in her brand new red sneakers, you see, and she had a lot of fun. Can’t wait for the warmer months so she can get some wear out of this outfit. So, Mr K’s mate at work turned 30 today. So rather than make another dark chocolate cake, I decided to make the Vanilla & White Chocolate Cake found in Baked: New Frontiers in Baking. I made this cake over 2 days – bake the layers one day and then ice/frost the next day. I read somewhere that baking a day or two in advance helps the cake layers to keep its shape and not crumble when it’s cut. Will I make this again? 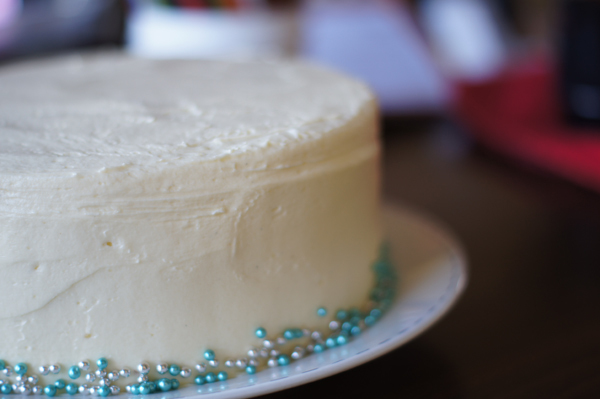 I’m not sure… but it sure did look pretty and sophisticated once it was done – even though my attempt at icing was very uneven in a lot of places. 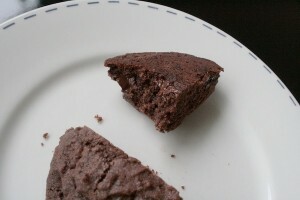 Here’s the recipe on http://sweetapolita.com, if you’d like to give it a try. 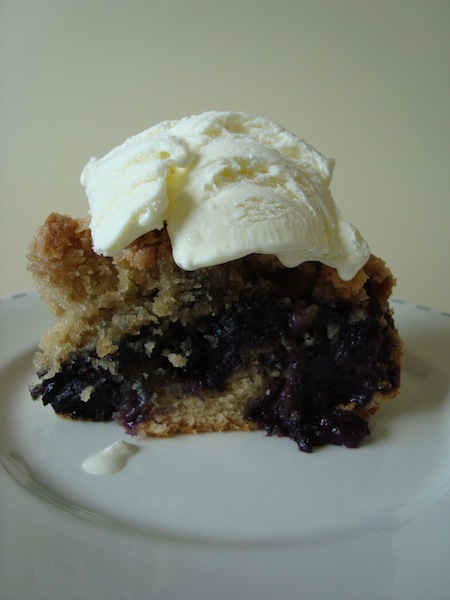 So… after lunch today I decided to make a Blueberry Crumb Cake for dessert after dinner. I saw that The Pioneer Woman had a recipe on her site and it was on my list of things to try. 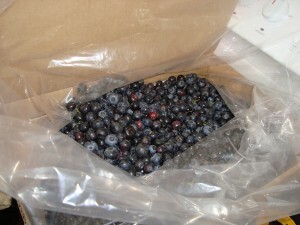 After all, we have a freezer full of blueberries and can spare a couple of cupfuls for this cake. 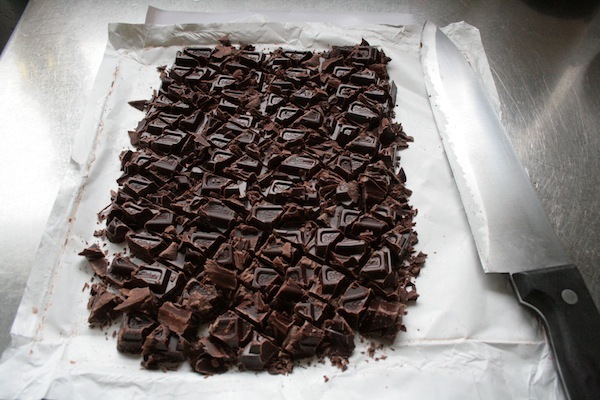 I got all the ingredients ready, but could not find my brownie tin. So I used an 8-inch round cake tin, which meant that it took much longer to bake and it would have overflowed if I didn’t have a baking paper fence surrounding the batter. The verdict? It was yummy – we couldn’t wait, so Miss S and I had a slice each (that was a quarter of the cake) – still piping hot with a big dollop of vanilla ice cream on top for afternoon tea. Mmmm… cake for dinner? 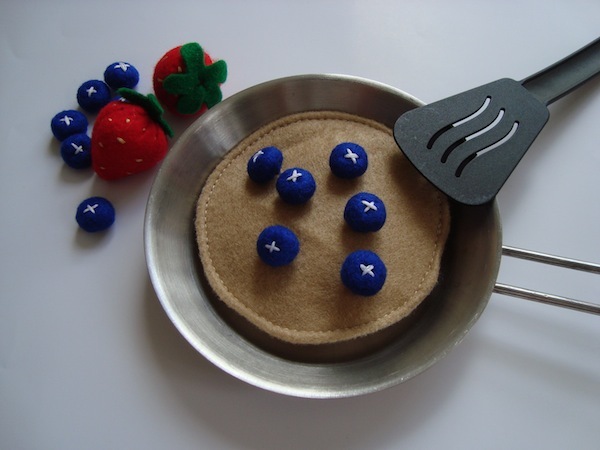 So… Miss S decided that she can’t eat blueberry pancakes almost every weekend and not have a set of felt ones to play with. So, I sewed some up yesterday afternoon. Miss S started listening to Audiobooks when she was about 18 months old. One of her favourites is Curious George Makes Pancakes. It wasn’t until she was about 2.5 that she found out what pancakes were. I finally found the most wonderful scottish pancake recipe by Sophie Gray (here’s a link to the recipe on Craving Fresh). 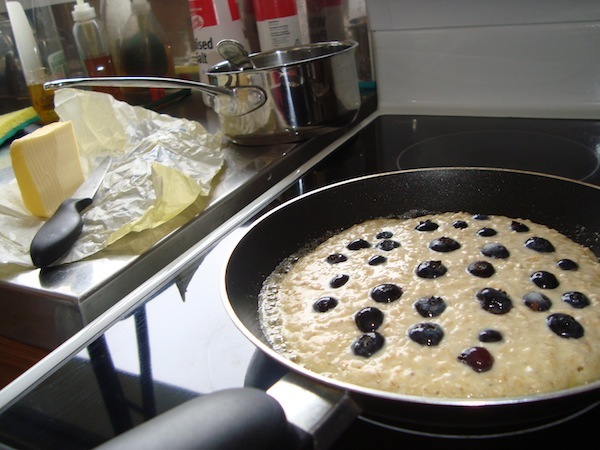 Add a handful of frozen blueberries to each pancake, a good pour of lemon honey or maple syrup…. yum… that’s usually what we have for breakfast most Saturdays. Us: No.. we’ll show you. 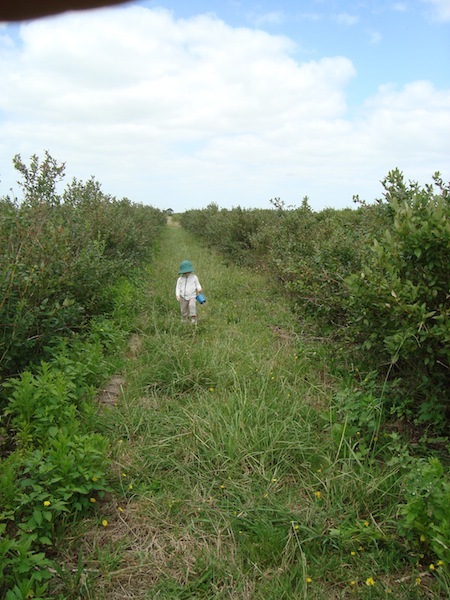 So, we decided to take a drive down to Ngatea to pick some blueberries.We made a day of it. Miss S was so excited about the fact that she could pick them off the bushes and straight into her little bucket. We all loved it (it was my first berry picking expedition too – the lone raspberry cane in our garden doesn’t count as we only get about 5 fruit each year). Methinks it’s time to make another trip. The 3 kgs we picked did not last very long – Miss S loves to snack on a bowlful of frozen ones every now and again. And this leads on to the next post… Felt Blueberries and Pancakes! 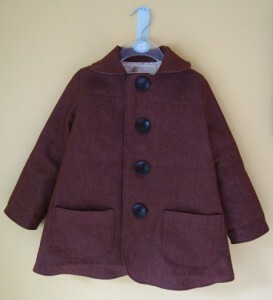 Last October, I bought 2 coat patterns from Dear My Kids – The Pea Coat & The Double Breasted Coat. Hmmm… coat patterns – in October – in the southern hemisphere. The thought of making a coat during the heat of summer just does not make sense. But as the cooler months start to approach, it was time to get into my first foray of coat-making. Miss S chose the Double Breasted Coat, so I based this coat on that pattern. Thankfully, Christine at fromanigloo had a sew-along (Day 1, 2, 3 & 4) for the coat, so I had a quick read before starting. She mentioned that they were a little on the small side, so I cut out the size 5 pieces and added seam allowances. 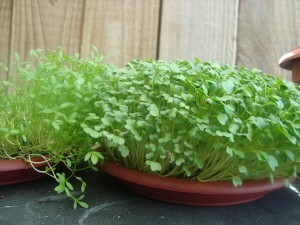 A few days ago, Annie’s Eats posted this recipe on her blog. Her photos are so incredible, I can almost taste the cookies! Almost, but not quite… so I printed out the recipe and decided to make a batch. As I didn’t have enough chocolate drops/bits, a whole block of dark chocolate went into the mixture. It was a very simple recipe to make. It wasn’t too sweet (which was great). It was rich and chocolatey, and I would definitely make this again – Miss S sized, so she can have a “whole” cookie rather than a 1/4 of a massive one. 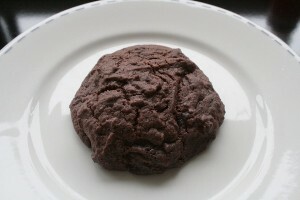 Chomp.. yum.... soft cookie, melted chocolate... you get the idea..
Well, it has been a busy couple of weeks. We’ve finally started working on the outside of the house. The deck got scrubbed and painted, The exterior of the house is about 3/4 painted. New baby gifts were made and distributed, books have been read, etc. Now that Mr K is back at work, we have to relegate the painting to weekends only. In which case, I had time to finish a few projects that I had been working on. 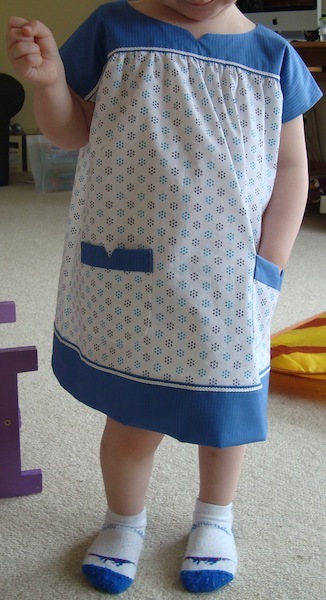 Miss S had been bugging me to make this dress for her since the pattern arrived in October (see post). I’ve since found out the reason why. As soon as I put the dress on her, she said “Where’s my ice cream, Mummy? This is the ice cream dress, so I get an ice cream.” Anyway, she picked the fabrics from my stash – I was a bit dubious at first, but they seem to work well together. I love the pockets, it was the first time I’ve made pockets and will definitely make them again. I read this post on fromanigloo.com, and thought, hmmm…. I’m going to give this a shot. I present to you Dolly’s Bed. It was so much fun, I made 3 more. We had a blast, especially Miss S who found out that the 3 other beds were for her friends for Christmas. Mr K thought it was so cool that he started making something too. Perhaps that will be in the next post. If you’d like to make a bed, here are the plans from ana-white.com. 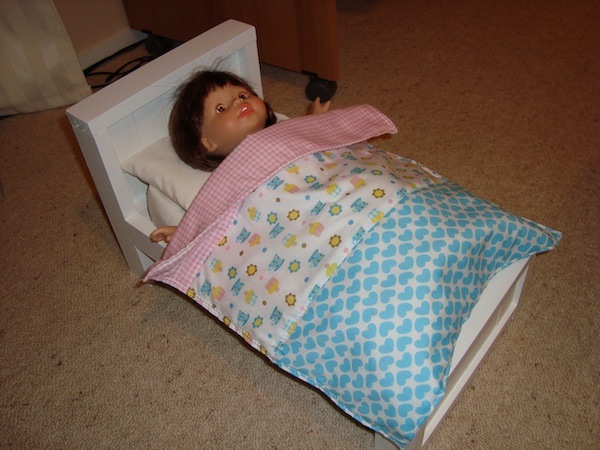 I’ve made some modifications to the ones I made as I didn’t get the exact wood sizes as specified – so the beds I made are single beds for 12-14 inch dolls. 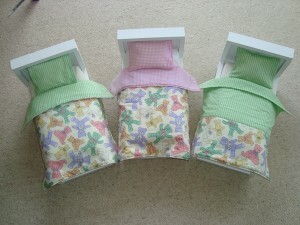 fromanigloo.com have posted a few tutorials on how to make the Pillows & Pillowcases, Fitted Sheet & Quilt. If you feel like giving this a try, go for it! It’s very satisfying to hammer in nails, to sand, paint, make a mess in the garage and not have to clean it up immediately.